After much anticipation, the gorilla tracking day had arrived. We woke up at 5:45 AM for an early breakfast, then drove into the village where all gorilla tourists, guides, and drivers convene. 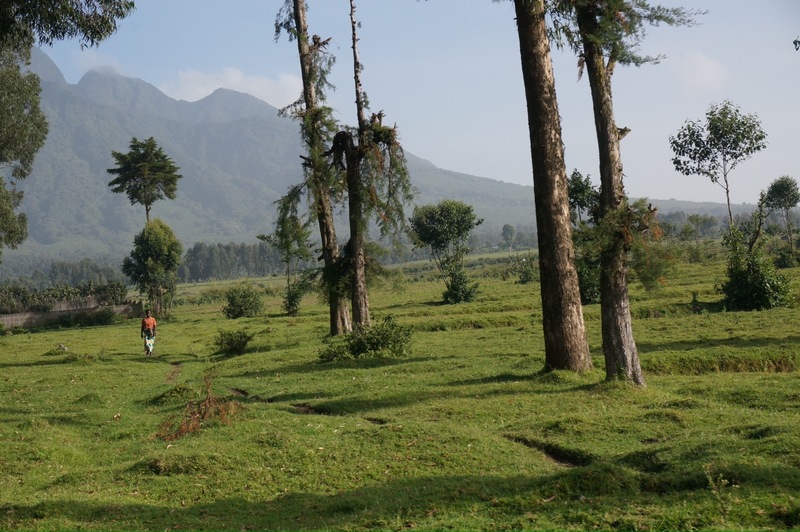 The guides and trackers meet and divvy up groups based on hiking ability and gorilla location. 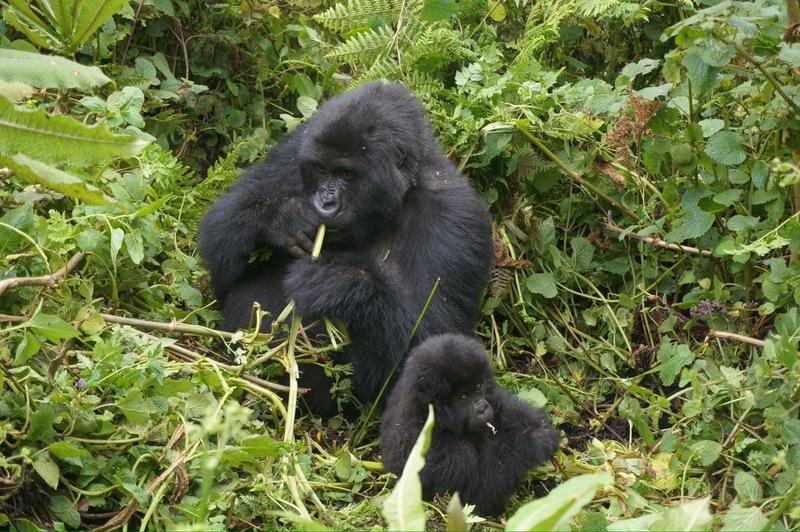 There are 19 gorilla families, about half for research and half for tourism. 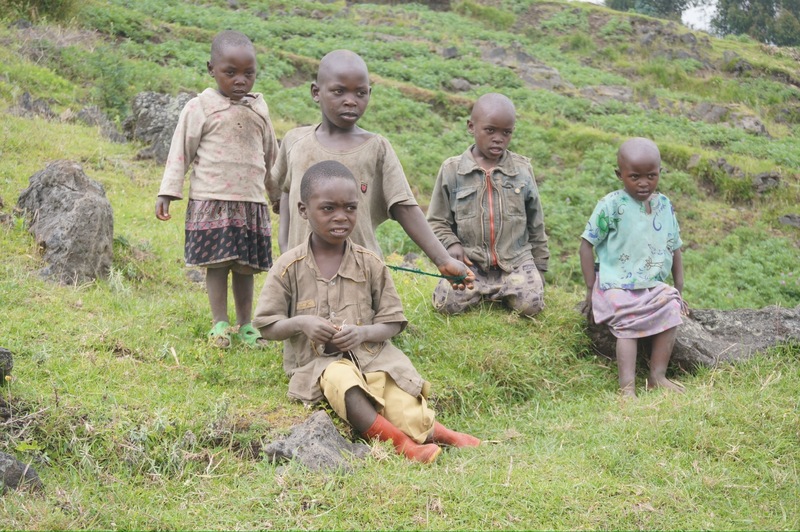 We were assigned to the ‘Kuryama’ family (Rwandan for ‘sleeping’), along with six other tourists and one guide, Augustin. 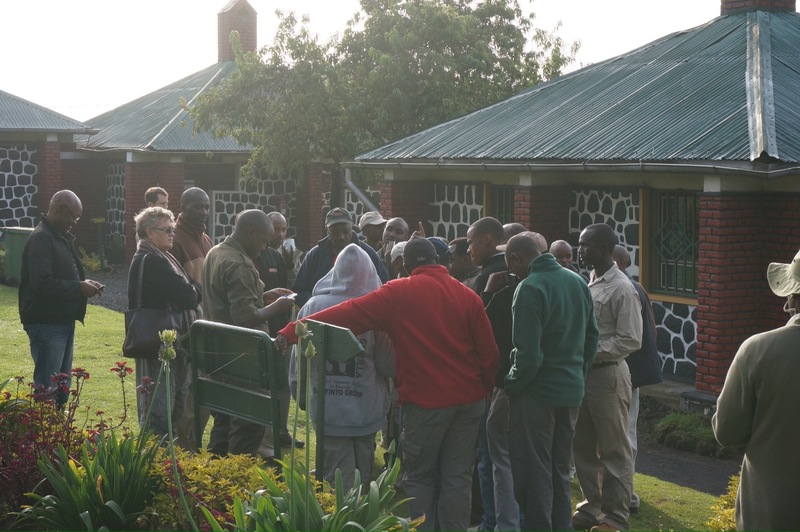 We drove a short distance to the park entrance and were met by a large group of porters. 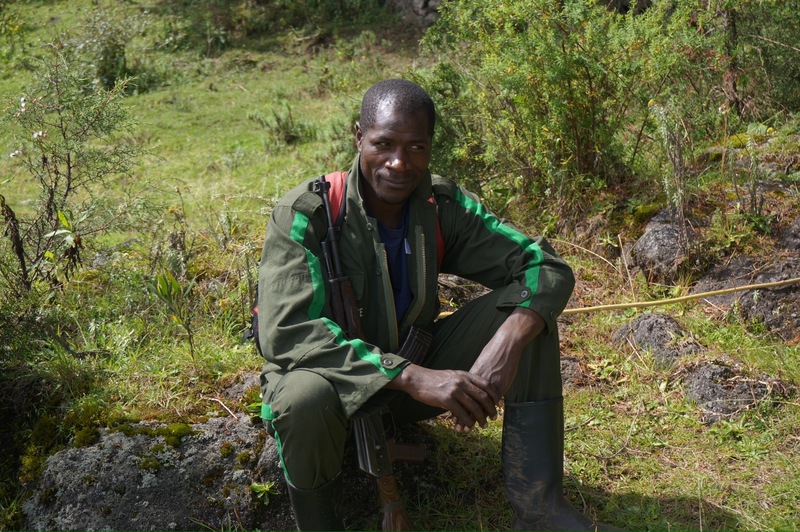 Many of the porters are ex-poachers, hired by the government as a way to offer an alternative career to poaching. Hiring porters is a good cause, can be very helpful, and for $10 seemed like a no-brainer. 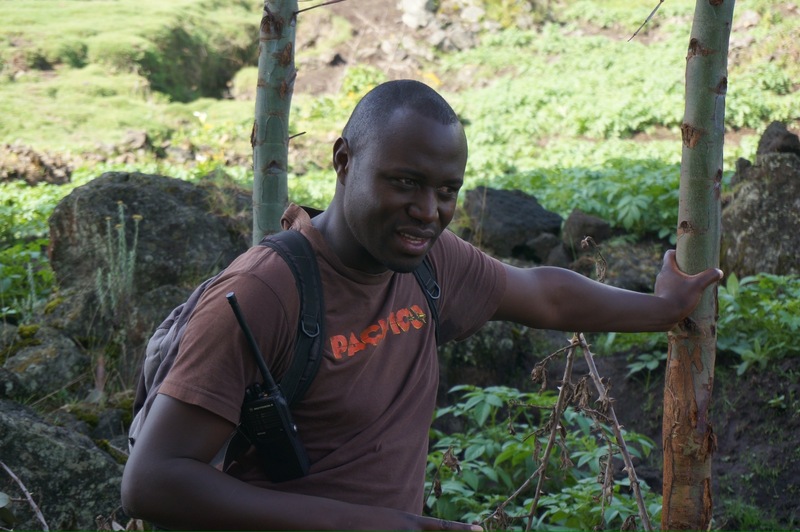 Our guide, Magezi, highly encouraged us to hire one for each of us. Of course, the two oldest couples in our group didn’t think they needed the porters, and they got CRUSHED on the hike up. Slipping in mud, totally exhausted, and ended up Shanghai-ing our porters to carry their stuff and help them through the mud. Oh well. At least one of them was a dead-ringer for Larry David (we added one photo of him in this post — you’ll know). 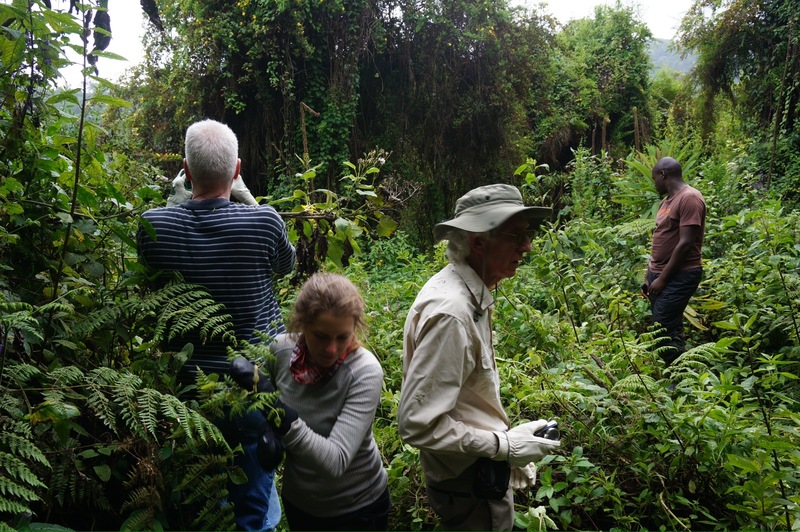 The hike into gorilla territory was about two hours uphill along private farmlands, then another hour through the thick jungle with the trackers. 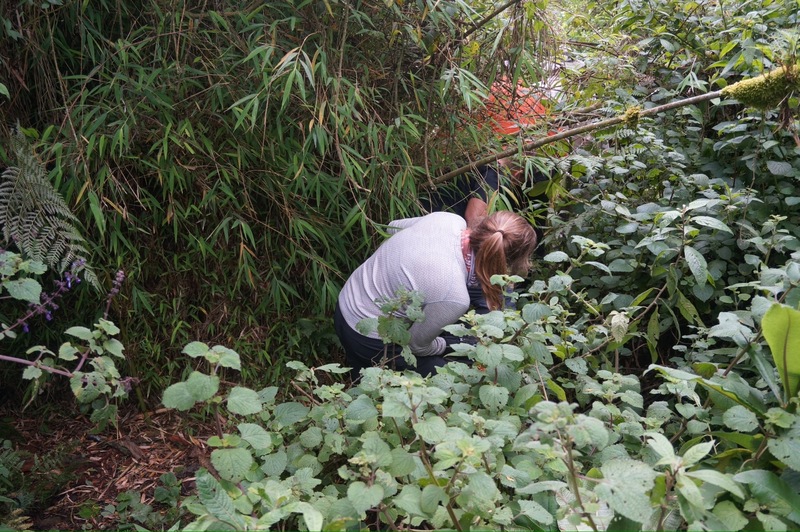 The trackers used machetes to cut back brush, and it was a good thing we wore gators because we were about a foot deep in mud at some points. 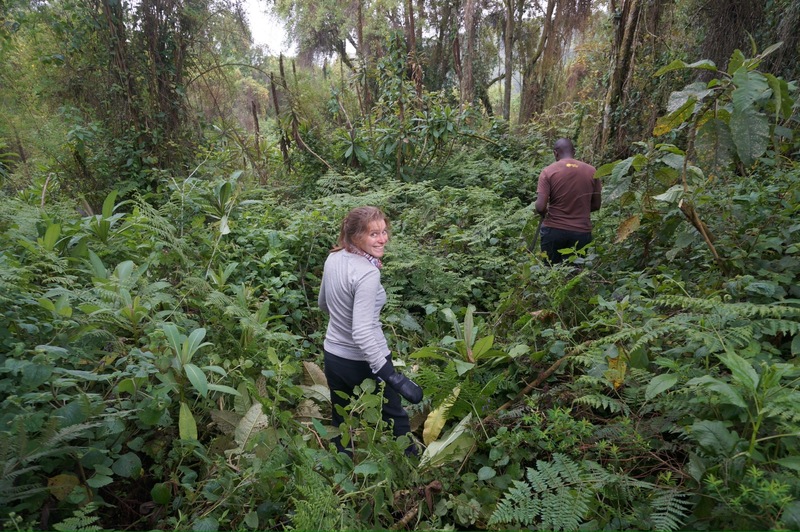 It had rained all afternoon the day before, but we were lucky to have zero rain on our hike, especially because the gorillas run unexpectedly as soon as the rain begins. 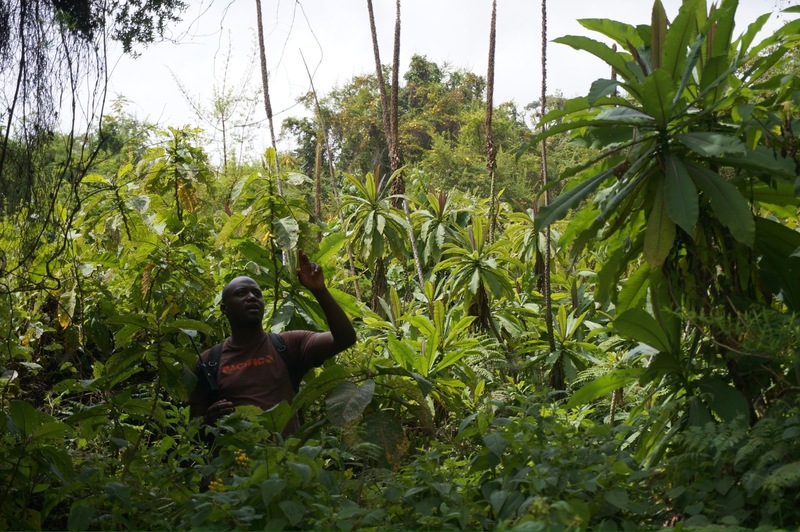 After an hour through the jungle and days of anticipation, all of a sudden, out of nowhere, there was a rustle in the bushes, then an enormous tuft of black hair. We found the Kuryama!! 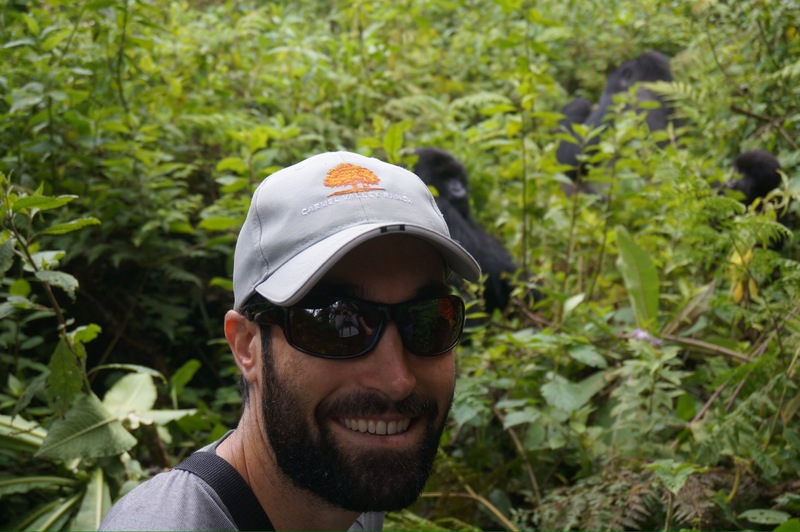 Per tracking guidelines, we had one hour to spend with the gorillas. We had gone from a group of ten humans, to a group of ten humans and ten gorillas. 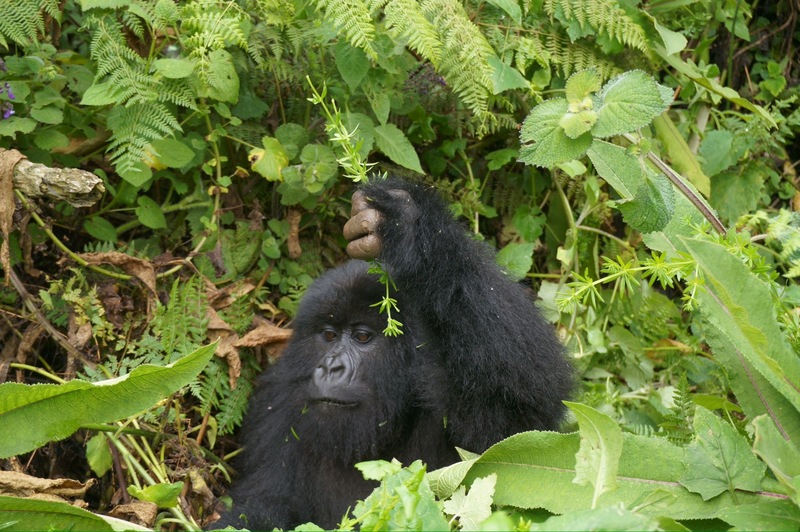 We were amazingly close to the gorillas, and at one point a juvenile ran by us and brushed against our legs. The gorillas sat eating, chomping on ‘white celery,’ completely undisturbed by our presence and endless photos. They eat, roll on their backs, and tumble down the hill to find more food. Pretty nice life. The cutest member of the Kuryama family was the baby. It was so little and cuddly, rolling around on the ground, acting silly and putting food on its head. It took every ounce of strength not to grab it and run. The one hour flew by and in no time we had to say goodbye to the gorillas and make our way back out of the jungle. 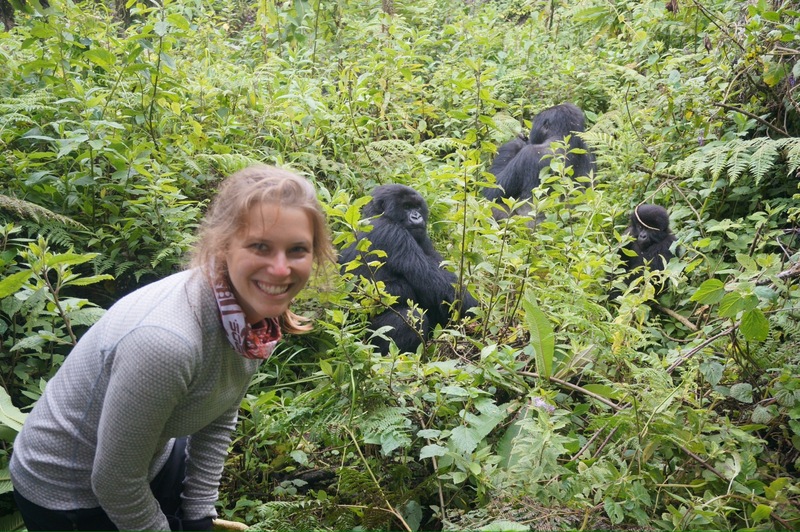 Though we had high expectations for tracking they were still exceeded — we never imagined we’d get so close to the gorillas. We also loved the experience of tracking them by foot, and standing with them in their natural environment. It’s completely different than a driving safari. 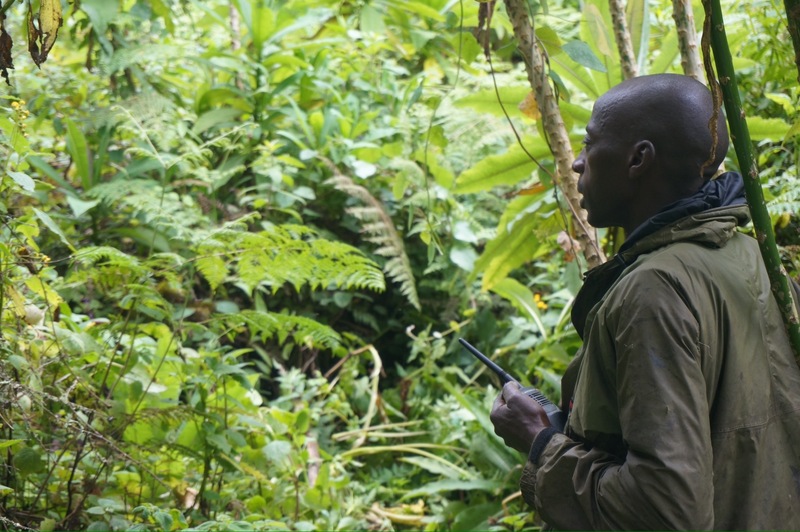 The price tag for gorilla tracking permits is exorbitant and still increasing every year as they try to limit the number of tourists. 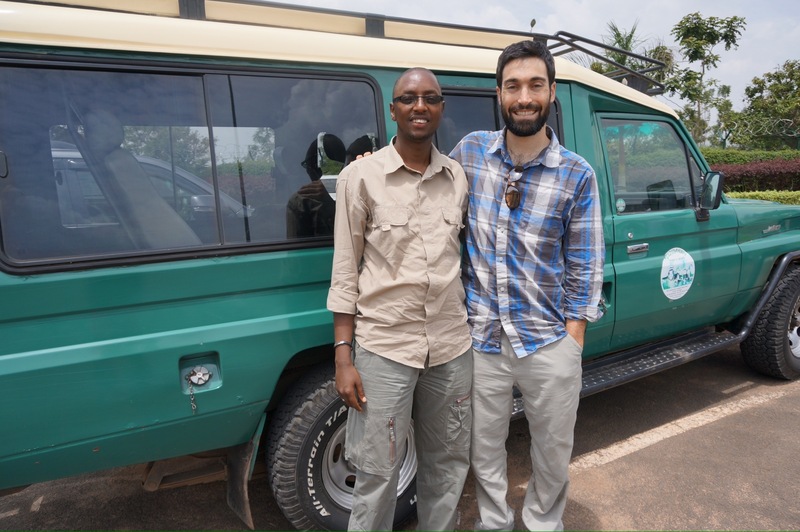 This was definitely a once-in-a-lifetime experience for us — not only because Rwanda is so far away, but also because the permits are a serious investment. So another amazing experience in a country I never imagined visiting. 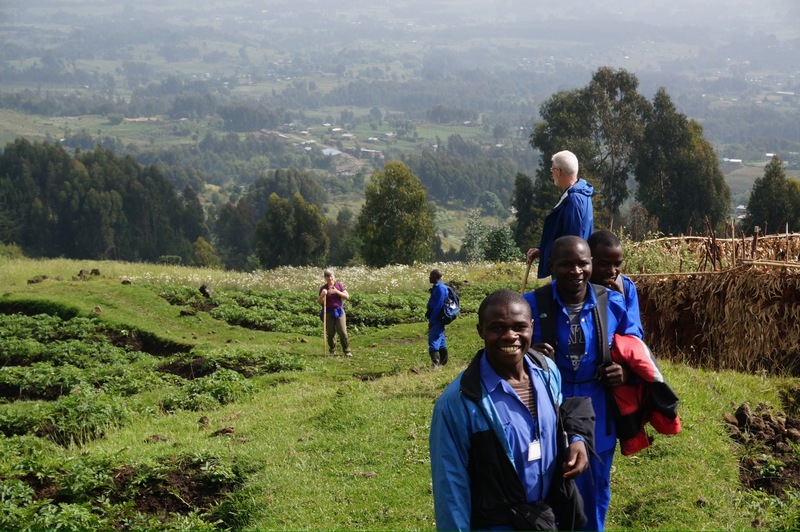 I now have very fond memories of Rwanda — the children crowding the streets as our truck drove up the mountain, waving their hands, running along with us, yelling ‘hello!’ ‘good morning!’ or ‘good morning teacher! !’ (they start each school day greeting their teacher with ‘good morning teacher’ – and it sticks 🙂 ). The people we met in Rwanda were happy and welcoming. The scenery is picturesque, green, clean. And the gorillas, of course, are magical. 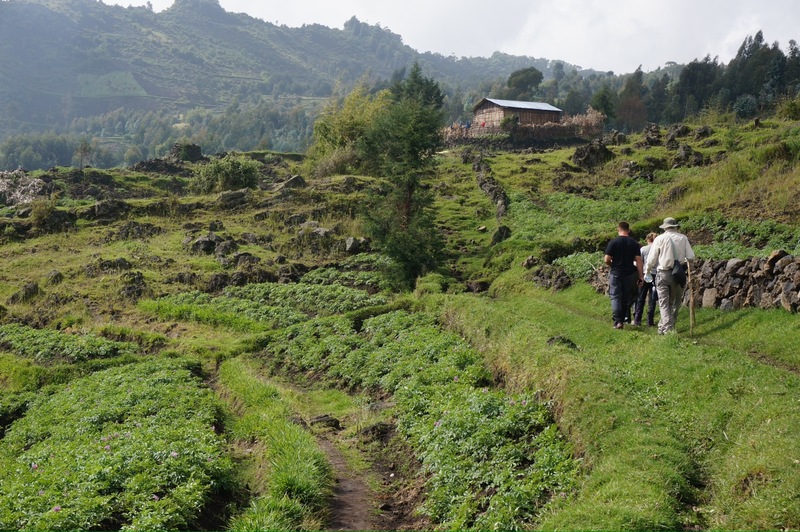 This entry was posted in Rwanda on February 24, 2013 by Dan. OK get ready for an unprofound comment. Are you ready???? : WOW!!! The gorillas were amazing. Jill looked like one of the pack, they were so comfortable with her! How old were the couple who didn’t need the porters, around 60? Such a self-confident age…..
Add this to your list of future vacations, Sam – you would love it!! I love gorillas!!! Wish I could have seen them. Speak tomorrow. Mom looking forward to actually seeing Dan’s cleanshaven handsome face. What a Larry David look alike- are you certain it wasn’t him? Also, the photo with Jill in the foreground and the caption that starts “The cutest member of the Kuryama family…..” For a split second I thought you had given Jill up for adoption! Thanks, Em! 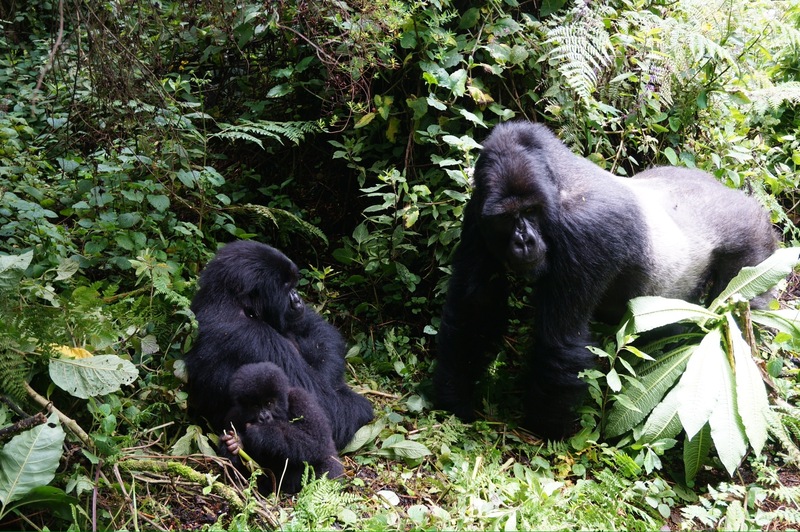 You would love the gorilla tracking – bring my mom!